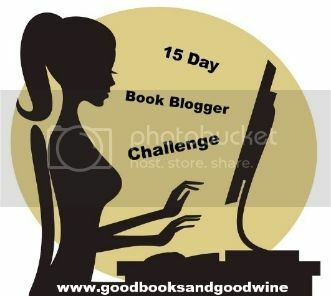 Midnyte Reader: 15 Day Book Blogging Challenge/Day 4. I may get in trouble for this, but I was so angry with Darkfever by Karen Marie Moning, I tossed it across the room. I NEVER literally fling books no matter how annoyed I am, but this one, I did. Not hard, but enough to have it land about 5 feet away. I know this is only the first book in the series, but it frustrated me to no end. It left me with more questions than answers. Sure we found out who killed Mac's sister, but we know nothing about him. We know his name (if that's even real) and we see him, but that's about it. We don't even know who Jericho really is! I have suspicions, but again more questions and dead ends. I also felt the end was kind of rushed to pave the way for the next book. I'm happier when a book, even if it's in a series, answers enough questions to keep you satisfied and leaves enough open to want more. Maybe another reason for my irritation is that everyone absolutely gushed about this series and about Mac and Jericho and their relationship. Don't get me wrong, I liked it, but not like everyone else did so that just added to my frustration. I was told to keep reading because the series gets so much better. I plan to, but haven't yet. Do you think I'm nuts for not loving this book? Has this ever happened to you? If you've flung a book across the room, which one and why? Labels: Book Blogger Challenge - Day 4. Last book you flung across the room. I may have to check out her challenges! Now that I've cut back and am not blogging every day, it's sometimes really hard to sit down and write up my posts (especially on days when I already wrote a stupid paper for school). I have Darkfever on my kindle but I've read a few excerpts with Barrons and I didn't like him at all. so I'm kind of afraid to start it. Good luck on the challenge. Sounds like a good way to give you a blogging reboot! I am so happy you said that! It took me 4 years to give the first book a second try, and another year to read the second book. And I never, ever, loved those characters Barrons and Mac as much as everyone else in the blog world is gushing over. I actively disliked them but read the books (yes I did finish them last year) because of the story itself. I just had to know. And now, this new series, I know I won't start reading it before there are a few more published. The only reason I started, is because I love her highlanders, but I did not love them in these books at all. Well, I made it to Shadowfever before I threw a book in this series across the room. I'm not a big fan of the series. I'm not a big fan of Barrons. And I DNF'd Iced. So, I commiserate, I guess? I haven't heard of this book before, but I think Rachel also answered this for today's challenge. @Steph-Yes, writing is hard work and it takes a lot out of you. A lot of people don't realize that. @Karen-I don't really like him either. I may keep reading though. @Aurian-I'm so glad you said that!!! I feel so much better. So is it worth it to keep reading? @Rubita-Okay, one more to validate me. I'm not sure I'll rush to finish the series. @Angelica-Yes, she did! Which made me laugh. Well, is it worth it, you have to decide for yourself. I will never re-read those books. Sure some amazing things happen in these books, and KMM writing style is awesome, but overall, it is just very dark, and I now know I don't like the darker side of UF. There is no happy ending to the story itself, but there is for Mac and her love interest.